You've bought rapina and shiitake mushrooms at the Broadway Farmer's Market (p.100) or maybe potatoes and tomatoes (p. 74). Soon, eggplant and fresh beans (p. 128). Make your own paneer (it's easy) and zucchini soup with ginger (p. 81) from Vancouver's famed restaurant, home cooking. Delicious! The team behind the world famous Vij's and Rangoli restaurants in Vancouver have an approachable follow-up to their award-winning, bestselling cookbook Vij's: Elegant and Inspired Indian Cuisine. 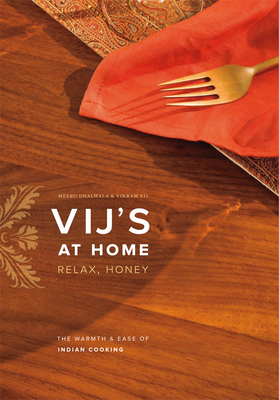 The easily adaptable, versatile recipes in Vij's at Home are tailored for busy households like theirs. Meeru and Vikram share how to prepare flavorful vegetarian dishes that go from stove to plate in less than 45 minutes as well as easy Indian seafood, poultry and meat dishes that come together in 20 minutes then simmer while the home chef sits down with a glass of wine, or helps the kids with their homework. Interspersed throughout, the endearing couple share aspects of the home life of busy restaurateurs, who still manage to cook with their daughters, eat at the dining room table and throw parties for friends. Pull up a chair--Meeru and Vikram invite you to dinner. Vikram Vij was born in Indian and grew up in Amritsar and Mumbai. He studied hotel management in Salzburg, Austria, before moving to Canada to work at the Banff Springs Hotel. He opened the original 14-seat Vij's Restaurant in Vancouver in 1994. Meeru Dhalwala was born in India but moved to Washington, D.C., at a young age. Prior to moving to Canada, she worked on human rights and international development projects. She and Vikram live in Vancouver.